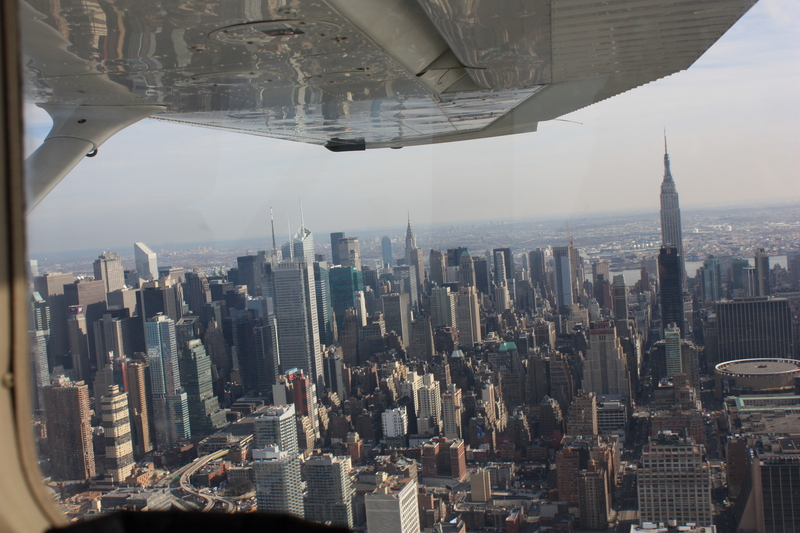 Flying the Hudson River Corridor Exclusion & Montauk Point! “First will be xxxx aircraft, then John in xxxx will follow on and next will be…” continued Bob from our flight school, who had planned the whole flyout to the last minute detail. I wondered how in the world we were going to keep the order straight leave alone spot the aircraft in front of us. Countless times ATC gives traffic warnings routinely. Only on a rare occasion am I ever able to spot the traffic. Often, I rely on ATC to tell me that I was clear of the traffic or to provide me deviations to avoid the traffic. Maybe it will all work out, I thought. 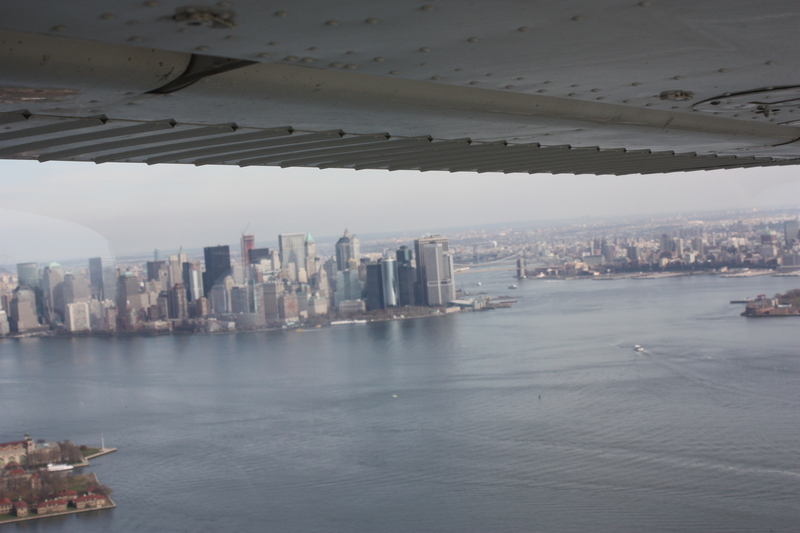 Being in a C172 and in no hurry to exit the Hudson river corridor, I and my passengers opted to fly second last. Bob in the Cougar was planning to fly last. Ten assorted aircraft ranging from Diamond TwinStar to C172 had left HEF and JYO and two hours later met at Belmar, NJ. Only one aircraft had mechanical difficulties and had to cancel. The plan was to depart in order, circle the airport until all aircraft departed the airport and joined the line of aircraft eager to fly the Hudson River Corridor. Then it was follow the leader direct to Apple intersection at 1,100 ft.
Ready for takeoff, 10 of us lined up and departed one after the other as planned. I could hear the Twinstar, first to depart circling the pattern, waiting for the rest of us to catch up. As expected once airborne, it was any one’s game. I had no visual of the aircraft that departed ahead of me. I think I lost him when he turned crosswind. And before I knew it, I was headed straight for Apple intersection, leader of the pack rather than the follower. The day was a little hazy but at 1100 ft, we had perfect panoramic views of the New York Skyline. Within minutes we arrived at the Verrazano Bridge (or VZ for short) reporting point. Out in the distance we could see the Empire State Building, the Chrysler Building, the vacuum that was the World Trade Center, and Wall Street. This was it! I was finally here, fulfilling my desire to fly up and down the Hudson river amidst some of the greatest achievements of mankind. I had always been in awe while walking the streets of New York, my eyes turned skyward stretching to see the rooftops of the magnificent skyscrapers. It was an odd reverence to see the immensely tall buildings at street level. Flying at 1100 feet, it was a different perspective. Looking down on them, I was still in awe of all the beauty and magnificence of them. I could almost feel the beat and tempo of the song in my mind and see my feet tapping to the tune. And what I wanted to do right then was to walk the streets of New York, feeling the rhythm of the greatest city in the world. We soon looped around and headed back south, past the Alpine Tower, GW Bridge, Intrepid Sea & Air, Goldman Sachs and finally approached the Statue of Liberty. 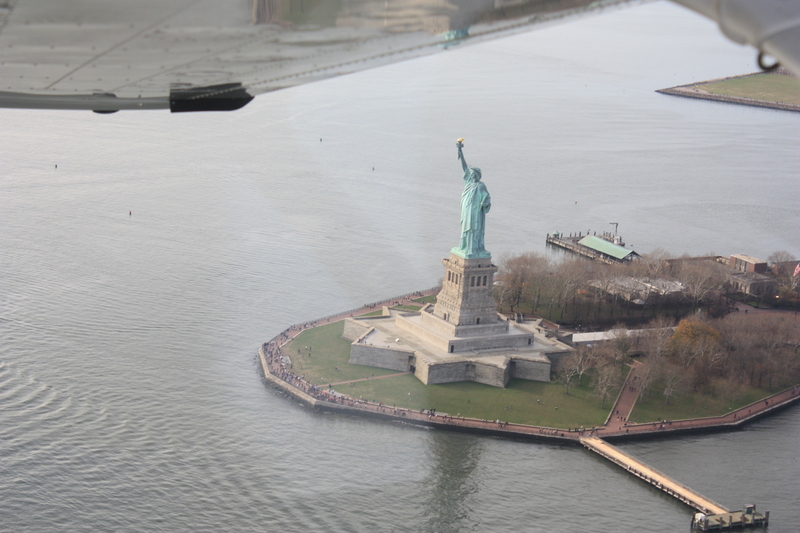 Dropping to 900 ft we circled the Lady (a gift of friendship from the French to the US – a symbol of liberty and freedom). I remembered taking the ferry to Liberty Island eons ago and taking the tour on my first trip to the Big Apple, climbing the monument to the crown through narrow winding stairs and getting a peek at the city through the crown on a cold winter day with my sister. Soon it was time to bid adieu and head home. We turned southward, turned on the autopilot, each of us lost in thought, tired, and hungry, but excited, relishing the adventure! This here was another of those “stops”, moments in a lifetime cherished but not forgotten. Previous Article Monday Morning Inspiration #43: Happy Spring!